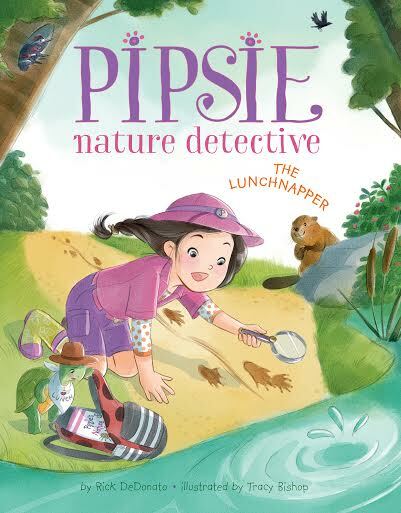 Pipsie is back in a new adventure - Pipsie Nature Detective: The Lunchnapper. Author Rick DeDonato takes us on an exciting nature scavenger hunt while giving us the mystery of who stole Pipse and her turtle pet's lunch. Along the way we learn about several animals. This is a fun way of incorporating knowledge in an adorable story. The illustrations by Tracy Bishop are adorable and fit the story well. We really enjoyed this book and it is a perfect addition to our spring time walks because it encourages my five year old to be on the look out for birds, animal tracks and even animals spottings! The search is on for the lunch that left, and soon Pipsie and Alfred are following animal tracks and discovering deer, birds, and even some beavers. Can Pipsie make this mystery history and finish the scavenger hunt? And hopefully before lunchtime, because Alfred is one hungry turtle! Continue the fun by getting a downloadable activity kit here! Visit PipsieNatureDetective.com for more games and coloring, fun facts, more details about Pipsie and her friends. One lucky winner will receive a copy of Pipsie Nature Detective: The Lunchnapper! How fun, I'd read it to my 8 and 6 year old girls! I think all five of my kids would love this one but especially my oldest two girls! My grandchildren love when I read books to them so this would be a treat! I would be reading this book to my daughter! She is three, I think she would enjoy this book. I would read this book to my nieces. I would read this to my daughter.